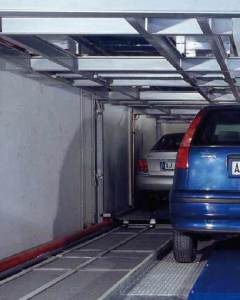 With many manufacturers now in this industry along with their diverse system designs, the actual mechanisms and movement systems that carry a vehicle to its parking spot can widely vary with each. Here we’ll group together the systems of similar type to create distinct categories, then discuss each technology along with its specific application pros and cons. In the US we have a long history of mechanical parking facilities. Starting in the 1920’s and again in the fifties, mechanical parking systems were built in this country. In Hawaii we built systems on Honolulu in the seventies and eighties. 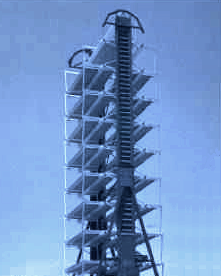 A typical modern mechanical parking system ranges from a simple two level cantilever variety, to multiple level systems complete with shuttles, lifts and rotator tables. Listed below are various types of mechanical parking systems along with their associated characteristics. Only systems with characteristics of worthwhile consideration for use in the US have been evaluated and listed. Many automated systems have been built across the country typically in dense locations where the project and the site requires an automated facility in order for the project to succeed. Automated facilities are more expensive in most locations than a ramp garage to build, however certain sites allow this type of facility to be economically feasible. Advantages such as dense vehicle storage, no pedestrian access to the facility and few attendants weigh in. A diverse variety of structural and functional types of automated, robotic, and mechanical systems exist, such as underground systems that are part of the building foundation or above grade facilities that match neighboring buildings in appearance. Listed below are the types of fully automated parking systems. Rated characteristics are ranked from a selection of manufacturers whose equipment is of worthwhile consideration for use in the US.